I keynoted at this great festival in 2013. Best looks EVER at Swainson's Warblers! 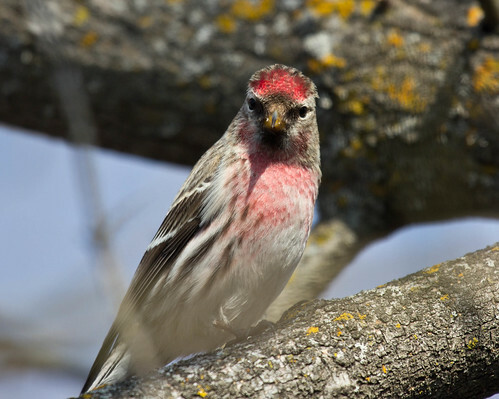 2015 is one of the magical years when lots of us are seeing gregarious winter finches that spend most of their lives in the northern reaches of Canada, Eurasia, Iceland, and Greenland, such as redpolls, or at least in the boreal forest of Canada and the northern reaches of the US, such as Pine Siskins. People notice them by their frequent, almost continual calling as they seem to be invisible within dense conifers, by how they congregate at feeders, and by how they gather at the salt and grit on country roads, barely taking off in time as we drive through. 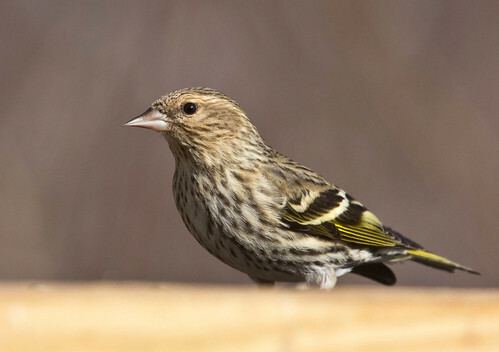 Finches feed almost entirely on seeds, and the grit they eat both helps their gizzard grind down seeds so they can extract as much food value as possible, and provides minerals that their simple diet lacks. Winter road salt lures them in even more than bird feeders do. It seems to me a no brainer that when flocks of birds are on the road, people should slow down, not just because of the immediate danger to the flock right there but because there are so many flocks all along. But our mindset gets so locked into human concerns, even as we drive through the most hauntingly beautiful northern forest habitat, that most people don’t even notice the enormous Great Gray Owl or the exquisite Northern Hawk Owl perched atop a tree right in the open near the road, much less the hundreds of little brown birds that look like leaf litter until they flutter off as we get too close. I see so many of them dead on the roads, and sometimes stuck onto car grilles—including those of birders who were in such a hurry to see the next new bird that they plowed right through the ones right there. 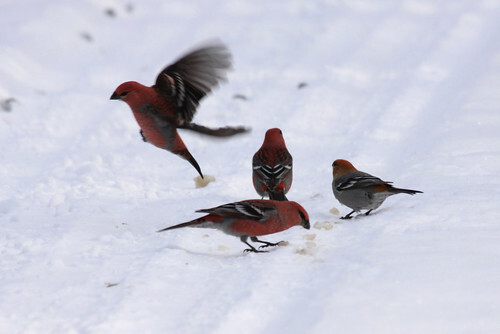 When we see these finches in their big flocks, it’s easier to see them as aggregations rather than individuals. 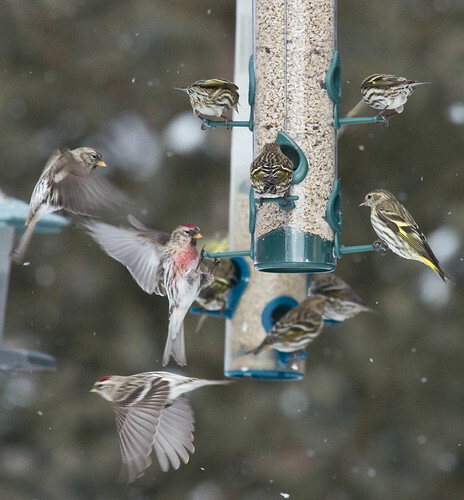 Of course, birders carefully scrutinize each individual in hopes of picking out a possible Hoary Redpoll among the Common Redpolls, or to find other outliers, but once our list needs are served, we all at least occasionally look at these flocks as undifferentiated winter finches rather than breaking them down into individual species. 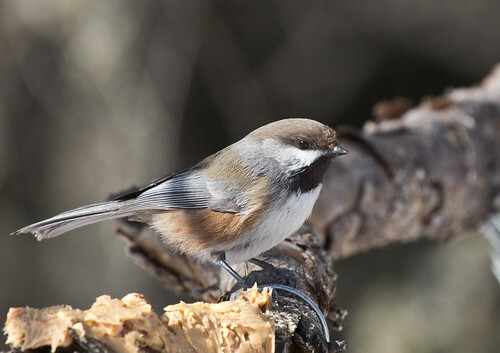 And even when we do that, we seldom pay the kind of attention to individuals that we do when we encounter an owl or shrike or curious chickadee. The more scientists reveal about bird intelligence and individual variation, the more strenuously people seem to grab onto that popular meme that individual animals don’t matter—only populations. I’ve always found that a depressing concept, because it’s so egotistical. 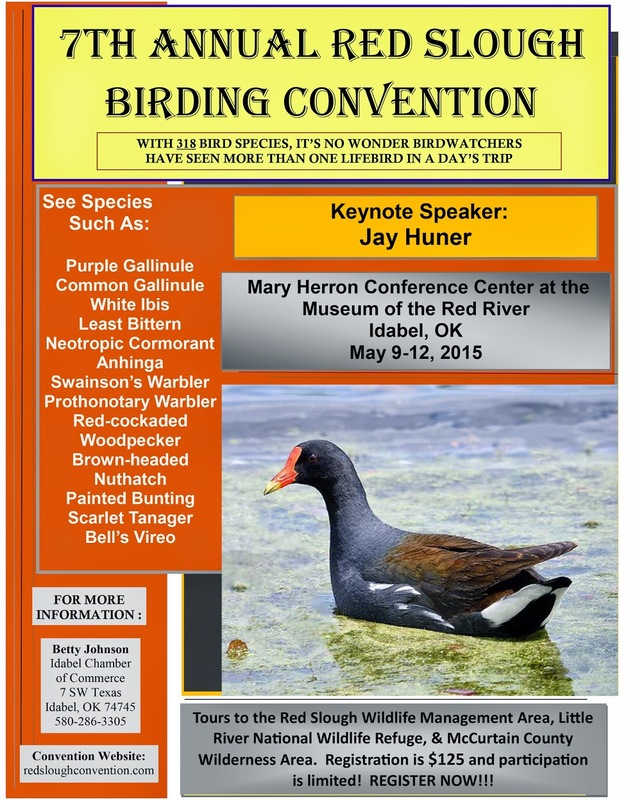 In terms of wildlife management and conservation, of course the focus must be on populations, but within these two disciplines, our sense of the appropriate size of populations is informed not by what is best for the larger world but by what will serve a given human “user group.” Red-winged Blackbirds are slaughtered by the millions in western Minnesota and the Dakotas every spring to appease sunflower growers. Cormorants are slaughtered in many areas to appease sport and commercial fishing interests. Meanwhile, white-tailed deer and Canada Goose numbers have been “managed” to bring them to unsustainable levels over decades, to please hunting interests, even after it was obvious that their numbers were growing too large for the health of major habitats and competing species. Now we’re watching that exact same ecological disaster slowly unfold with Wild Turkeys. Meanwhile, I hear the same delight in shortsighted people seeing turkeys in their area for the first time that I heard back in the 70s when people were so thrilled to see Canada Geese raising young in places they’d never before bred. We are supposed to be the smartest species on the planet. We could use our intelligence to look at the Big Picture of population levels even as we see the Little Picture—the value of individuals of all species. We could learn from our mistakes. We could use our supposedly superior awareness to notice the beauty all around us. And we could use our supposedly superior ability to plan ahead so we’d leave early enough to drive a little slower during times when birds gather on our roadsides. Forest Gump famously said “stupid is as stupid does.” The same also could be said of human intelligence. How did you spend your Friday the Thirteenth and Valentine's Day? I managed to find a unique way to combine both bad luck and the heart to mark this year's back-to-back Friday the 13th and Valentine's Day. Thursday night I had a mild heart attack. Friday, after everything was stable, they did an angiogram, which indicated that I have a congenitally enlarged coronary artery. Apparently a clot developed there and then got blocked from passing into a more normal artery. I've been on blood thinners since as soon as I was admitted, so am entirely out of danger. I didn’t need a stent or any surgery at all. I'll be taking medications and use one of those days-of-the-week medicine things now, so can officially feel old and decrepit with a minimum of actual problems associated with it. This was pretty much a best-case scenario for a heart attack. It was indeed scary, but after receiving excellent care at the hospital and now some follow-up appointments and 36 sessions of cardiac rehab, I’ll be entirely in the clear. Usually at this point in a radio program, I’d talk about whether or not birds have heart attacks, and get into lots of cases. I’ll just say, yes they do—both from clots and from other causes, especially associated with their high blood pressure. Fighting males rarely but occasionally have keeled over dead from their heightened blood pressure actually blowing out a hole in the heart or a coronary artery. But I’m going to break my normal pattern this time because I’m extremely lucky that I realized I was having a heart attack. Symptoms in women are way different from those we usually hear about. I did not feel ANY pain or tightness or heaviness in my chest when I decided I was probably having a heart attack. I just suddenly, after getting ready for bed about 10 pm, had a fuzzy, weird feeling in my chest, a sensation that was running up my neck to my jaw. The sensation itself made me feel a little panicky, so when I climbed into bed, I kept sitting up and thinking I just felt wrong. The possibility of a heart attack was on my mental radar screen because in the past couple of months or so, I’ve had four or five dizzy spells that lasted only a few seconds. They felt weird and nothing like anything I've felt before, but I couldn't see making an appointment unless they got worse. Also, for two or three days before the heart attack, my face looked paler in the mirror to me. My father died early one morning when he was only 50 from a massive heart attack, and my aunt, his sister, died this summer after waking up, getting out of bed, and simply dropping dead. In my last photos of both of them, their faces seemed unusually pale. I’m not particularly superstitious, but it did occur to me that, uh oh—if this was an actual heart attack, there was a pretty good chance I’d climb out of bed on Friday the 13th and keel over dead. And that made me think of the puppy I’m getting in 5 weeks—how much I want to be healthy to train and play with her, and how she deserves a healthy owner. I still thought if this was a heart attack, I should be experiencing some actual pain, so I opened my iPad and googled heart attack symptoms. They all started with descriptions of massive chest pain or pressure (like that "elephant sitting on your chest" I'd read about) radiating down the left arm, but then got into more vague symptoms, and all specifically mentioned jaw pain, especially in women. I wasn’t having pain, but my neck and jaw as well as chest had that fuzzy, weird sensation. So Russ ushered me to the hospital. The guy at the door admitting patients looked rather skeptical, but the moment he let me through, I was ushered away, with a whole team wiring me to an EKG machine and an IV and taking blood tests and I don't know what else. My EKG was slightly abnormal. The first blood test for a protein called Troponin that is released into the bloodstream after a heart attack was negative, but they were concerned about the EKG, and the next time they did the blood test, it was, indeed positive. Six hours later, it had risen even more. So the event was an actual heart attack, and it turns out that it was very lucky I went in before it became a massive one. Those strange symptoms women tend to show, which often do not involve pain, are too often not taken seriously until it is too late. So there you have it. I guess I dodged a bullet. But really, if I had to have a heart attack, could the timing have been better than the weekend when Friday the 13th and Valentine’s Day collide? **I don't want to be answering everyone's questions about this ad infinitum. This was not an aortic stenosis, I have no problems with valves, and virtually no plaque buildup. And I do not need anyone's suggestions for or critiques of my treatment. I'm doing what I'm supposed to be doing and thinking about my puppy. **Additional update: I had to be hospitalized again due to a horrible reaction to Lipitor. Fortunately, my blood cholesterol levels are only marginally high and there was no evidence of any significant clogging of my arteries—just that genetic aneurism—so statins aren't really called for in my case anyway. This was way more debilitating than the heart attack itself, but I'm back on the mend. **One final point: Having a heart attack is terrifying. I am trying to make light of it, partly to reassure my family and friends that the probabilities of my keeling over dead haven't risen too dramatically above what they are for any reasonably-in-shape 63-year-old, and partly because that's the way I always cope with things. But just because I am trying to deal with it as best I can does not give anyone the right to make jokes about it, and especially not to say "I thought you had a sense of humor." This is a no brainer, and as far as friendships go, a deal breaker. This past weekend, a birding acquaintance of mine from Florida came up to Duluth to celebrate what I’ve long called Superb Owl Sunday. He arrived on Friday afternoon, and we birded steadily during daylight hours until he left on Monday afternoon. 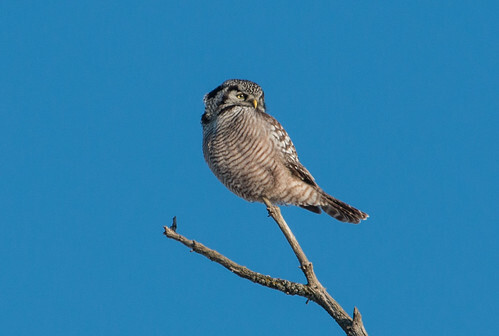 He added three lifer owls—Snowy Owl on Friday at the Superior Airport, Great Gray Owl on Saturday in the Sax-Zim Bog, and Northern Hawk Owl on Sunday on Jean Duluth Road north of Duluth, so both Superb Owl Sunday and the rest of the weekend lived up to the hype. We also saw lots of other northern birds that were new for him. So all in all it was a wonderfully successful weekend. Maybe that sense of targets is the trick for me. I have a genuine antipathy for wasting fuel, so I don’t bird far from home without serious thought about the energy costs, but I do love occasionally getting up early and setting out for the bog, or for the Superior National Forest along Highways 2 and 1 north of Two Harbors, in hopes of seeing cool birds. It’s fun to be open to all the possibilities without specific goals, and my birding virtually never holds any disappointments—heck, even when I went to Quincy, Illinois on a failed effort to see an Ivory Gull, my lasting memory is more of what a fun experience that was than of disappointment. 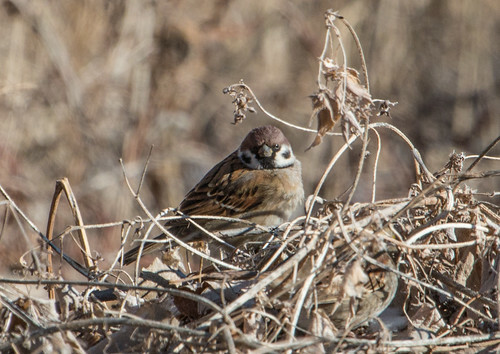 My first Illinois Eurasian Tree Sparrow--bonus bird when I was in Quincy, Illinois. When it comes down to it, I’m a moseyer. Like any other birder, I love having as long a list of species as possible for a given jaunt, and measure my skills by the birds I pick out by sight and sound. When I started birding, before I'd brought my life list to over 600 for the Lower 48, I was pretty intent on that milestone, but even when I was most acquisitive, except on specific "Big Days," I've never enjoyed birding just to have a long list of species. 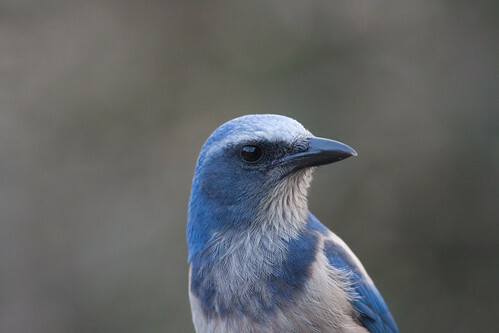 The Florida Scrub-Jay was #600 on my life list. I saw my first, with my whole family, in 1999, at Lake Kissimmee State Park. My kids and Russ were all charmed by these friendly birds--the PERFECT milestone species for meeting my ultimate birding goal of 600 species in the Lower 48. Looking back on most birding jaunts, I remember specific cool experiences with individual birds and other critters far more than the final number. And I especially don’t like feeling responsible for what other people see. I do enjoy leading birding field trips—those experiences helped improve my own birding skills when I was starting out, and I love sharing my knowledge of places and birds with others. But leading field trips never feels anywhere near as intense as showing someone who has come a long way all the birds that person "needs” to see to make the trip worthwhile. When I was amassing my own life list and Russ and I took trips to new places, I loved exploring on my own. We covered all the best spots in Florida, southeastern Arizona, the Rio Grande Valley of Texas, Florida, and California following instructions in birding books and checking out spots that looked interesting or just happened to be near where Russ had to be for something else, as well as the spots pinpointed in the birding books. The pleasures came from getting a feel for different habitats and how to find different birds in new places entirely on my own. Even when I did my Big Year, when part of the whole point was to amass a big list, I did most of the birding by myself—somehow birds feel more earned and “mine” that way. I did have some special target birds for which I spent an inordinate amount of time searching, like the Colima Warbler for which I hiked twelve miles, alone in the rain, in Big Bend National Park, and the Hermit Warbler for which I went to San Lorenzo Park in Santa Cruz, California, three times before I finally got the bird--though each time I went there, I had plenty of other wonderful experiences, as well. 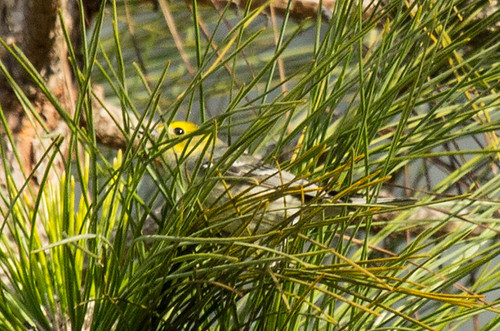 Crappy photo of a Hermit Warbler--a target bird I specifically searched for three times before I finally saw. 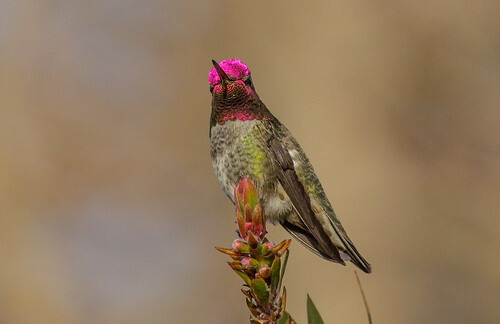 Anna's Hummingbird: One of the bonus birds I saw one of the times I was missing that Hermit Warbler. On my Big Year, I relished getting to spend days of intensive birding with a few close friends, such as Paula Lozano in Ohio, and Eric Bowman, Larry Foard, and Ali Sheehey in California. I also participated in a few birding festivals for which I was a speaker and so got to attend the field trips. I thoroughly enjoyed the Space Coast Birding Festival in Florida, the Red Slough Birding Festival in Oklahoma, the Biggest Week in American Birding in Ohio, the Rio Grand Valley birding festival in Texas, and the Monterey birding festival in California (I wasn't a speaker at the last two), and I took two guided tours with Kim Eckert, to Texas and Colorado. I was invited to be the keynote speaker at Kansas's Wings N Wetlands Birding Festival; when that was cancelled because of the drought, I still got to go and was taken around to great places by Curtis Wolf and Robert Penner. I spent a couple of weeks in Delaware, being escorted to splendid birding spots by Debra Chiczewski. To see a Bicknell's Thrush, I went on the auto tour up Mount Washington, so I wouldn't enter and risk disturbing more pristine habitat. I heard and saw Kirtland's Warblers on my own, knowing how to find them without going off roads (they're loud singers! ), but I also went on the public tour to support the best way for anyone to add this splendid bird to their lifelist. 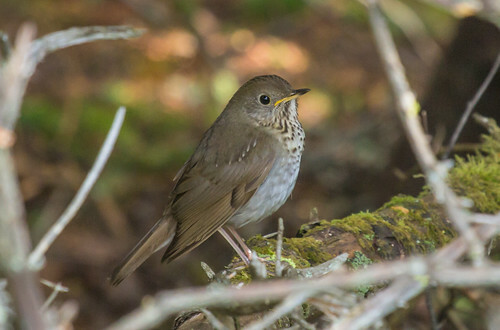 Bicknell's Thrush seen on the Mt. Washington Auto Road tour. 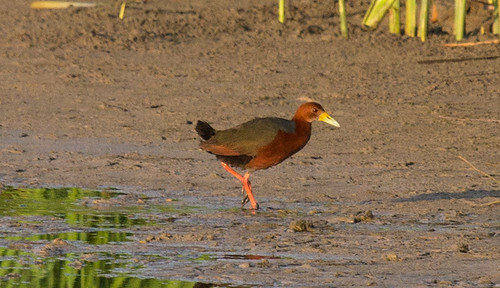 When I was headed to the Southwest, I learned that a Rufous-necked Wood-Rail had just been found at Bosque del Apache National Wildlife Refuge, so I made that my first stop. Hundreds of birders descended on the refuge for that first U.S. record bird, and since the only vantage point to see it was from a specific boardwalk, birders gathered with lawn chairs and cold drinks for what felt more like a social event than a birding jaunt. It was wonderful fun, and most of us got to see a really cool bird, to boot. So I do enjoy all kinds of birding experiences. But on my Big Year, I was very pleased to see every species of North American warbler entirely on my own at least once, except for the MacGillivray's Warbler that I only saw one time, with Eric Bowman in Yosemite. That one we both picked out simultaneously, so we both earned it. It was fun to see a Swainson's Warbler—a North American lifer—with Mia Revels, the researcher who is the expert on the Oklahoma population, as well as hearing them and getting one quick glimpse entirely on my own. Spending time with experts and local authorities provides a wealth of information impossible to get entirely on our own, and can be darned fun as well. 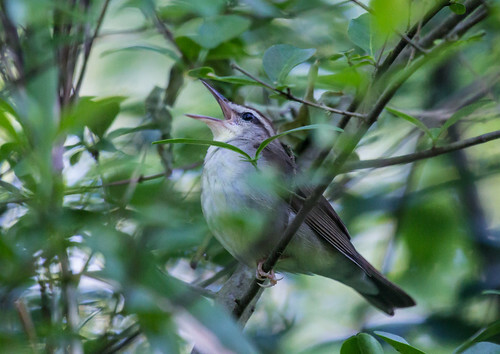 Swainson's Warbler found by Mia Revels in Oklahoma. 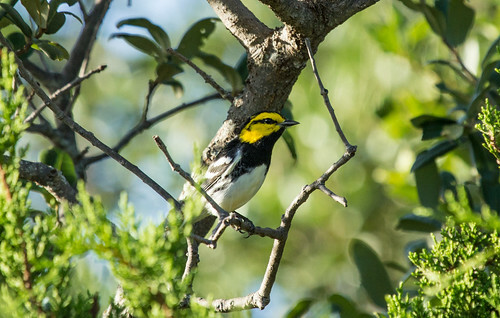 My friend Heidi Trudell told me exactly where to go to get my North American lifer Golden-cheeked Warbler at the Balcones Canyonlands National Wildlife Refuge. The birds were silent—I got there in late afternoon in mid-July—but it was thrilling to find them entirely on my own. Golden-cheeked Warbler in Balcones Canyonlands. I sat on my good friend Susan Eaton's deck eating lunch while watching Eurasian Tree Sparrows in comfort at her feeders for my Big Year. So it's hardly that I object to easy birds or birding with pleasant company. 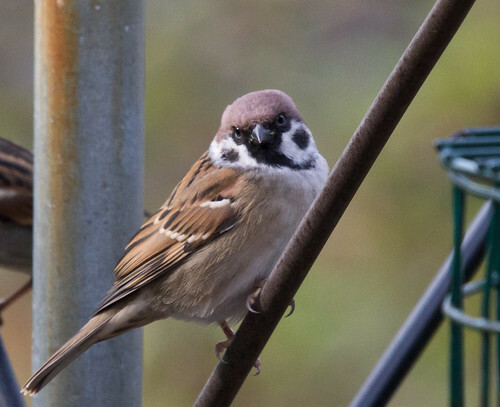 Eurasian Tree Sparrow in my friend Susan's backyard. I enjoy being a participant on birding tours, too. They allow us to see more species than what we could find on our own in an unfamiliar area, plus we don't need to drive or figure out logistics—that's all taken care of. But except when I’ve birded outside of the country, I’ve virtually always birded a new area on my own before going out on an organized tour—it makes me appreciate the leader’s added knowledge and local experience more, even as I recognize many of the birds from having figured out their habits in that habitat on my own. But I'm really too much of an introvert to enjoy large group birding too often. And there is no way on earth I'd be good at actually leading an organized tour. I forget about food and am perfectly content to sleep in my car when I'm having fun birding. You can't hear a Flammulated Owl calling all night long from even the finest motel, while I got to do just that when sleeping in my car in Water Canyon in New Mexico. Normal people expect meals and a bed to sleep in and have other needs I just don't want to deal with. And I'm completely out of my element at explaining what expenses and responsibilities other people should take care of themselves when birding with me, so I'm easily taken advantage of as well. I read a lot of posts by birding guides on Facebook, and am always impressed by how they can go out, day after day, week after week, showing each individual of each group a huge number of birds. They earn their pay with their skills, ability to juggle logistics, and unflagging focus and ability to keep moving on to the next bird while ensuring their participants all have a satisfying experience. It was fun for me to get out for one weekend for the first time in years to show someone around the north woods. But the experience reminded me that at heart, I really am an introverted moseyer. Recently I discovered that a few bird guides and photographers up here have been publicly ridiculing me, claiming that all my knowledge comes from reading about birds rather than going out and actually experiencing them. That's hurtful, of course, as well as patently false, but I don't even know how to begin to answer that kind of silliness. Fortunately, most of the birders up here, like everywhere else, don't need to cut down anyone else to carve their own place in the birding world. As Robert Frost might have put it, birders work together, I tell you from the heart, whether we bird together or apart. 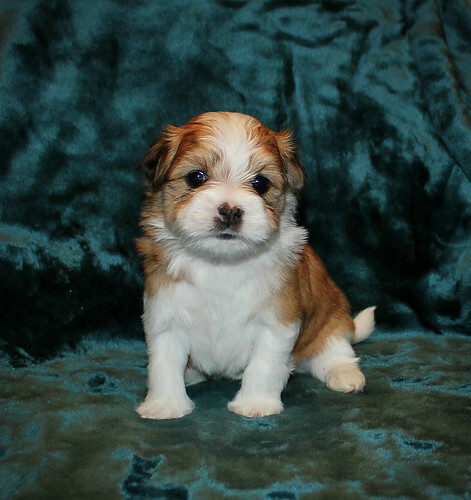 I can’t wait to get my new puppy. I’ll take Pip everywhere birding with me. I may have named her for a character in Great Expectations, but the great thing about puppies is they don’t have any expectations. For her, our tracking down every pigeon and nuthatch will be an adventure, and when we don’t see the birds I want, she’ll be perfectly content with what we do find. That, for me, is what the funnest birding is all about.